and so it goes, round and round. Sound familiar? For ages I wondered if it was just me, but talking to other surfers made me realise that there are lots of us that sit in the sea and debate with ourselves over whether to stay and wait for the perfect wave or go for it and risk ending up inside and tiring yourself out. Now as we know, there’s no such thing as a perfect wave. And as I’ve been reminded many a time, you have to catch waves if you want to get better at surfing, even if you fall off, you learn a little more every single time. 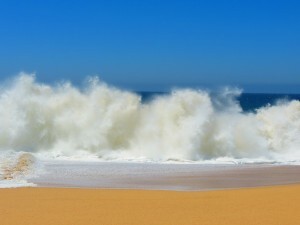 So what is it that scares us so much about fully committing to a wave? I talked to lots of people to find out the common fears, and their tips to help you see they’re just fears rather than actual danger. It’s helped me a lot so that I win the battle in my head and go for more waves. Hopefully they might be helpful for you too! Everyone falls off waves, even the pros. Believe me, you’ll look more daft paddling out, sitting there for an hour or two, and then paddling back in, than you will actually going for some waves. Even if you only make 10% of the waves you go for, that’s more than you will if you don’t go for anything. Hold your breath now (humour me) and see how long you can hold it for, just count in your head, you don’t need to actually time it. Remember that number, in fact do it again just before you go out for your next surf. When you take one on the head or fall off and get tumbled, count how long until you come up again. I bet it’s not nearly as long as you think! I rarely even get to ten, let alone anywhere near 30. Knowing that I can actually stay down for a lot longer than I usually do changed my perspective and massively increased my confidence. And if you’re like me, you really shouldn’t be out in any waves that are going to hold you under for even close to 30 seconds. If you are it is definitely time to get out! Yes, you might end up just going back and forth, paddling for waves, missing them, getting caught inside, battling to get back out. But it might be that your paddle strength could do with some work, so even if you do knacker yourself out quickly, it’s all good for keeping (or getting) you surf fit. Now, of course I don’t mean paddle for everything and drop in on people. Use your common sense here, look around you. If there’s someone already paddling or on the wave then of course don’t go for it. And if there’s someone right in front of you and you’re not confident enough to go round them, then hold back. There will always be another wave. But if it’s your right of way then go for it. Now what I find quite a lot if it’s busy, is when I’m paddling for a wave, even though it’s my wave, other surfers (usually guys) will paddle anyway in case I don’t catch it. This always puts me off, and I used to just stop paddling, but now I’ll just go for it anyway, it makes me way more determined to catch it so I can prove them wrong! Most of the time they’ll pull back if I do catch it, or be so fast that I’ll never catch them up anyway. And if I don’t catch the wave then at least the wave doesn’t go unridden. But I do know that sometimes it’s just so crowded that it’s not really fun any more. If you’re already out, can you just move to a different peak or go further down the beach? Or if you’re not in yet, is there another nearby break that’s less crowded? I quite often go to a break that’s going to be smaller. If you’ve got a big enough board, even 2ft waves can be super fun, and with all the ‘good’ surfers fighting each other at the other break you can sometimes get waves completely to yourself! Hat tip for this to Pete Curtin, Irish legend, whose constant piss taking reminded me that I can’t just never go for waves and still call myself a surfer, and to the random surfer we met at El Sunzal in El Tunco for the holding your breath tip… works like a charm! Fear can be a big factor in how many waves you catch, but don’t let it rule you. What are your tips for overcoming the fear? Tell us in the comments below. Thanks for this! … as a girl who definitely gets scared off when I notice another guy paddling (and assuming I’m not going to make the wave) … this was the lil’ confidence boost I needed. Nice to know you’re not the only one, eh? You don’t know how much the counting tip saved me! I’ve been learning to surf and after being pummeled on the inside a bunch of times I started to experience anxiety when out in the water. To the point where I’d just paddle in and stay on the outside- completely paralyzed by fear. After reading your post I decided to paddle out and give it a try. After paddling in and hanging in the safe zone my friends egged me on to paddle for a wave. I went for a wave and got pummeled: …1 … 2 …3 …4. Honestly after 4 I remember relaxing under water and coming up smiling. After that I was confidently charging after every wave in that set. Psyche is high! thanks! Only a matter of time before I catch that first wave. This is such great news Joseph, I’m so stoked for you! thanks for this post. it touches the exact fears and feeling i feel every time when im in the water. this post is priceless for beginners !! About the issue with the breaths – what problematic for me is that when i fall off and get tumbled i usually tend to exhale air out of my nose so water won’t enter when im upside down in the wave. so the air is being held for much less time. does this happens everyone ? by your post i guess not. so how can you avoid off water enter your nose ? It’s much better to hold all of the air in. Don’t exhale anything. Breathing out just reduces the available oxygen in your lungs. Source: I did a freediving course. This is really helpful. I have been surfing for years, but go so rarely that I end up starting over every time with the same fear and trepidation. The waves look lovely from the beach: not too pushy, not too big. But when I am paddling out into them they do this whole Count Dracula thing where they rise up and try to look as menacing and bloodthirsty as possible. (I have spent a LOT of time looking at this view, too scared to paddle out, so I have had time to let my imagination run wild). Getting pummeled and surviving is definitely helpful but I think it is also about time in the water… Which I clearly need more of! Thanks Amy. So reassuring to know I’m not the only one who has this problem!